My LYS has a sale every year on super bowl Sunday. I really wasn't planning on going; I have felt little call for more yarn of late and have wanted to work from my own collection. And yet, on Thursday at yarn group someone pulled out a couple of skeins of Colinette Giotto in a lovely deep muted plum color. My colors. But I resisted. There were only two skeins, not really enough to do anything with. After I got home I realized that that particular shade of deep plum might be the perfect thing to use with some soft green Colinette yarns I bought years ago and had realized I would never use. They are not colors I can wear near my face; I bought them long before I had heart surgery, back when I was incorrectly color-typed as an Autumn. Still, I did love the yarn. I just couldn't figure out how to use it. The deep plum is the larger bundle of plums, 2nd from the left in the photo. 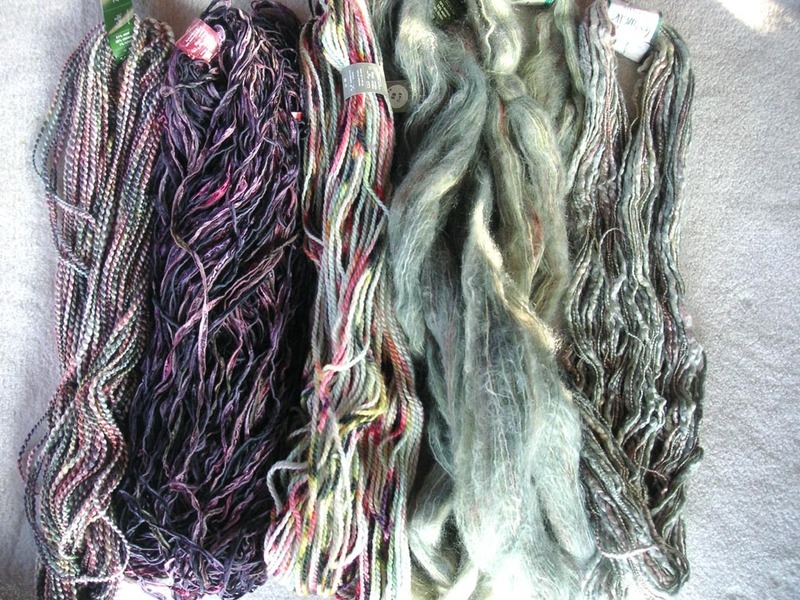 Of the original 5 skeins of green Colinette yarns, the two that worked with this plum are the two shown on the right in the photo. I also purchased another Colinette kit and divided it in two. 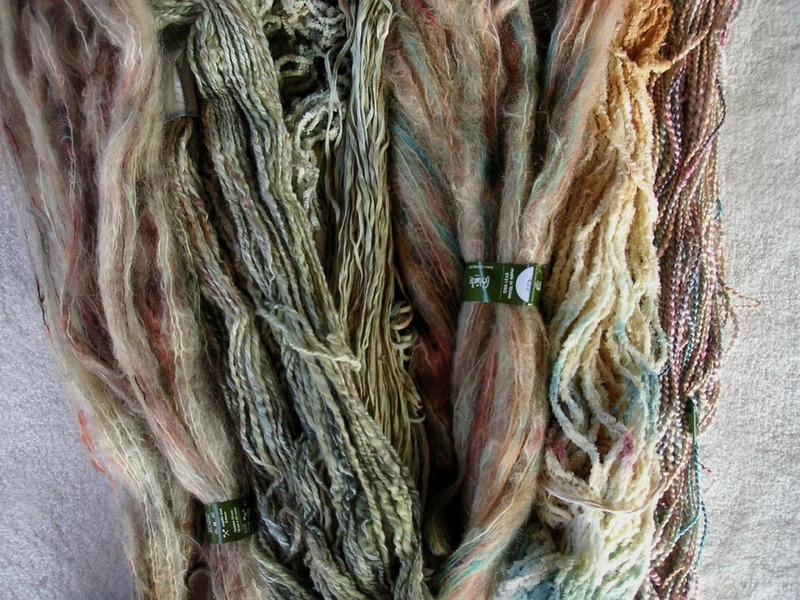 Three skeins went into this bundle (one was the same mohair I had from the first kit, same color way, different dye lot). The remaining yarns from the two kits all worked together to form a grouping for a second sweater. The colors here are still green but mixed with yellows and a little bit of purple. These colors cannot all be worn well next to my face, but they work well with several colors I wear frequently so I think this sweater will also be lovely. I don't have patterns for either sweater but I have ideas in my head. I don't think this sweater will be completely planned out in advance. Although I will work out a rough guide and make a gauge swatch, the sweater will evolve with the knitting. I think the first Colinette sweater, the one with the plum Giotto, will probably be the next one on my needles when I finish Rage Management. There is another cardigan I had planned on making but I think that has just been bumped back one. Actually it may depend on the weather the day I start. If it is cold I will start the wool cardigan. If it is warm I will start the Colinette stripey sweater.